This week’s Pet of the Week is a one year old male hound named Burney. He loves to play with others and having wide open spaces so he can run around just as much. He isn’t that big on toys but he still loves to play no matter what. He’s very friendly towards others and is quite an affectionate dog. 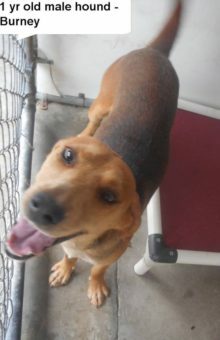 “Burney is a very friendly and affectionate dog that needs a new loving home. Please come out and meet this sweet young boy and give him the home he deserves.” said Karen Suggs, Manager of Bladen County Animal Shelter. Adoption fees will be waived for the month of June but vaccination fees will still need to be paid. The cost to adopt a dog is $50 and $40 to adopt a cat. The adoption hours are Monday to Friday at 12-5:00 p.m. Donations of dog food, treats, toys, and cat litter are accepted by the shelter.